With all the madness of Christmas it makes a big difference to have a few extra little tasks (especially the ones that are left to do at the end of the day) done for us. Children love responsibility and the my little elf helper jar is a great way for your kids to help around the house and really show Santa what a helpful and caring little person they are! Not only can you pop tasks in that will occupy them for a bit like drawing a picture for grandma or putting all the clothes back on their barbie dolls, but you can add in some tasks that really do help you out for time canadian pharmacy no prescription like putting dirty clothes into the laundry room or placing all of their shoes in one spot. I normally start the jar early to mid-December to keep them interested right up until Christmas eve, we take a picture every couple of days to send to dad when he is away so that he can see what an amasing job they are doing! Write up or print the age appropriate tasks for your child onto the paper. Cut and fold, placing each task into the jar. 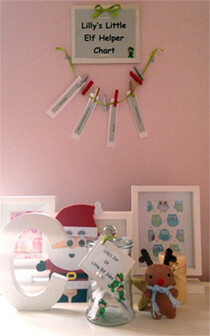 As the tasks are completed simply hang them on the wall for all and most importantly Santa to see!